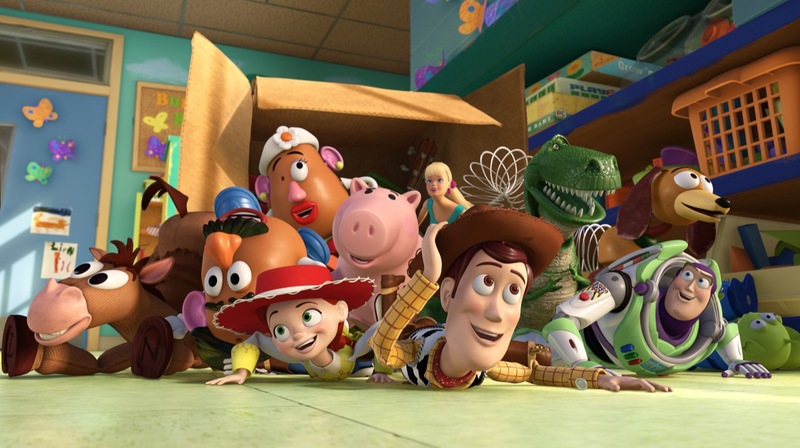 Toy Story 4 is Officially Scheduled for 2017…….But Why? There has been a rumor going around, leaked in large part by Tom Hanks, that Disney has been working on a Toy Story 4. Today, rumor became official announcement and Disney Pixar announced that they will indeed be releasing a fourth installment in the founding franchise of Pixar some time in 2017. John Lasseter, who directed the first two films, talked a little about the genesis of the project. Apparently the idea was a collaboration between the Pixar giants: Andrew Stanton, Pete Docter and John Lasseter as well as Toy Story 3’s director Lee Unkrich. The script for Toy Story 4 will be provided by actors-turned-screenwriters Rashida Jones and Will McCormack, who previously penned and starred in Celeste and Jesse Forever. They’re working from a story idea by Lasseter, Andrew Stanton, Pete Docter, and Lee Unkrich! Pixar’s Galyn Susman will produce. Every time they’ve gone back to make a Toy Story sequel, I thought it would be horrible. Every time they made me eat it and eat it big time. Toy Story 3 had me crying unashamed man tears and I was not the only big guy in that theater all off a sudden transformed into a child losing our favorite toys. It was a perfect ending to arguably the only perfect trilogy ever made. WHY IN THE WORLD DO YOU DO THIS? Money. Ok, perhaps I’m wrong and the talent that came up with the idea are some of the best minds in the history of animation. However, this is not something operating in a vacuum. Cars 2 &3, Monsters University, The Incredibles 2, and Finding Dory are all already released sequels to previous Pixar works. Cars 2 and Monsters University are respectively horrific and average. Everyone knows that since John Lasseter is now in charge of theme park, animation and live action films now, how that particular sequel got greenlit. Brave was good, but nowhere near the standard of its predecessors and the production was tumultuous to put it kindly. The Good Dinosaur, originally scheduled to be 2015’s Pixar film has had so many problems that I wouldn’t be surprised if it was scrapped altogether. The only other original film in development is Pete Docter’s Inside Out, which looks really smart and promising and those are two words I haven’t associated with Pixar decisions or product since Cars 2 ended the veneer of perfection the company exuded. The third one ended on such a perfect note that I’ve been dreading this news for a long time. Saw it coming, though. But here’s the thing… each sequel was not just better than its predecessor, it was exponentially better. That sets a high bar, but it also means there’s a chance they’ll knock this fourth one out of the park too. It’s not Monsters U that has me worried, it’s Brave. And not because of all the film’s mistakes. The problem was intent. It was only for kids. I just cannot fathom a better ending for those characters than TS3. Lasseter has me worried because I think he’s stretched too thin an none of those original Pixar Gods are writing the script. I knew it would happen too, I just REALLY did not want to, and that lack of new IPs coming out of the studio is really troubling. Grown men cried at the end of Toy Story 3. I’ve observed that phenomenon exactly twice in my life, the second time was Terminator 2. When you accomplish something like THAT with a movie, it’s what you call lightning in a bottle. But the second time you try it, you’re making a calculation, and it never works. For example, if you haven’t heard yet, Sarah Conner was now raised by a Terminator (Arnold again) and she calls him “Pops.” I am not making this up. LALALALALALA I didn’t hear that.